Eggs in Hell. Because it’s Valentine’s Day and maybe you’re jaded? Or maybe you’re just into easy and healthy like I have as of late. Promise me that you’ll be casually lounging in bed and your partner will ask, “hey what’s for breakfast?” You’ll answer, Eggs in HELLLLLLLLLL. Make sure to drag out the Hell, because you’ve gotta keep it interesting. Also, said repeatedly counts as one cup of coffee. First off, gently break 4 eggs into ramekins so they can come to room temperature. It’s all egg purgatory as you chop the living daylights out of an onion in front of them. You’ll need some tomatoes for later, so keep them close by…because, they’re next! Breakout your cast iron and I don’t mean for beating intruders. 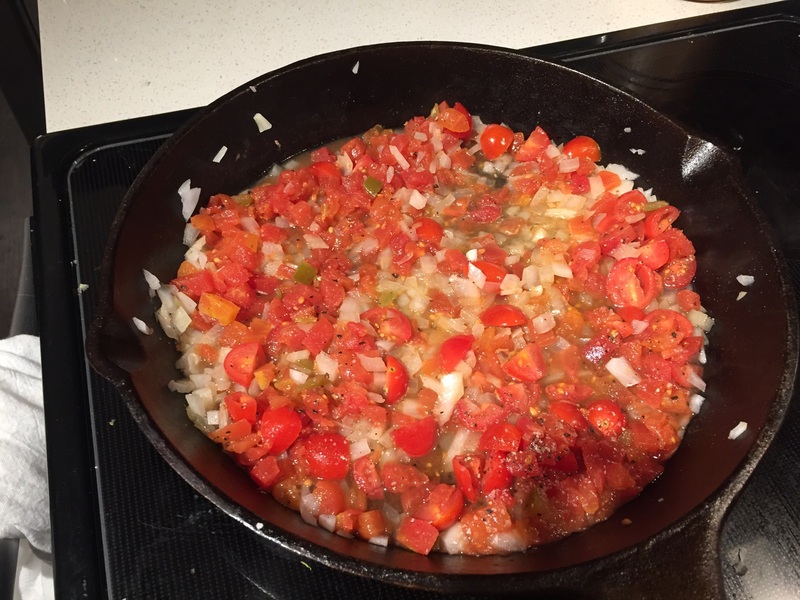 First, saute your onion, then add fresh tomatoes you’ve diced, and a can of tomatoes with chiles. Saute around 10 minutes, until the juices have evaporated. Just like in hell!? Then, slice an avocado and display in a wheel on top of tomato mixture. Not the prettiest thing, but at least it’s healthy. Gently slide eggs on top of avocado, careful not to break the yolk as seen in far back. Whoops! Salt and pepper vigorously. 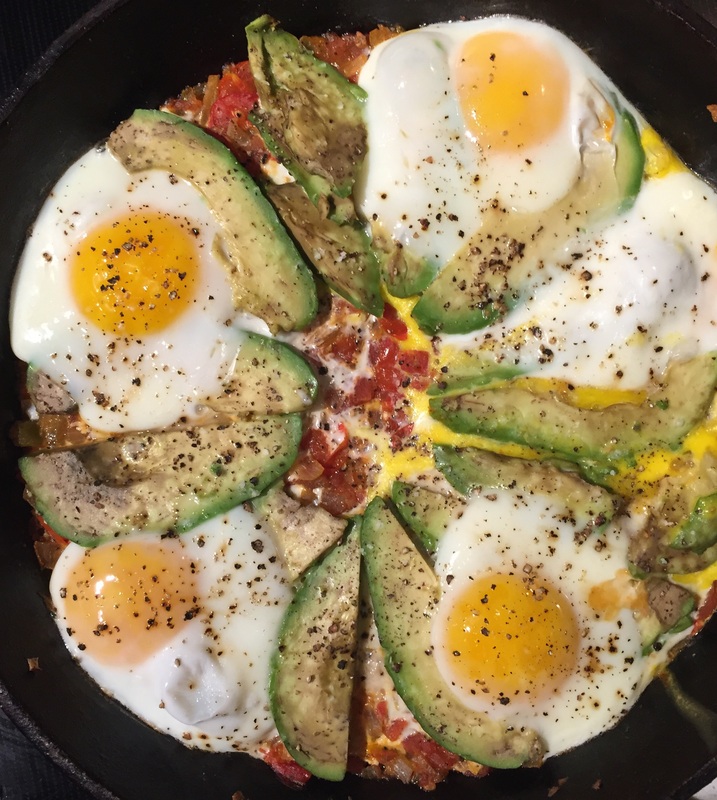 Bake the whole skillet at 375 for about 10-12 minutes or until your yolks have reached your desired degree of runniness. Now, you’re in hell! Congrats! 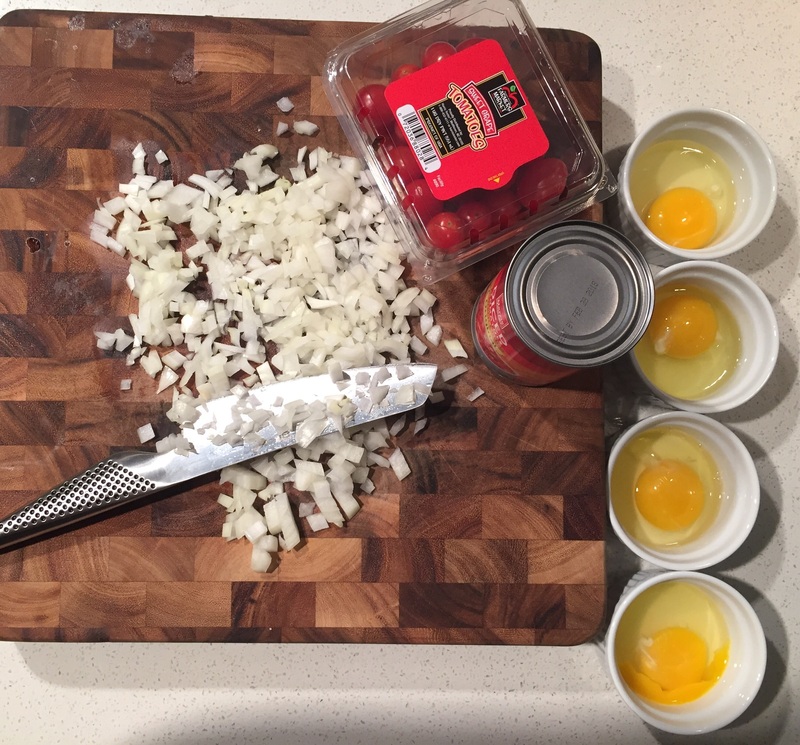 Carefully break eggs into individual ramekins so that they can come to room temperature. 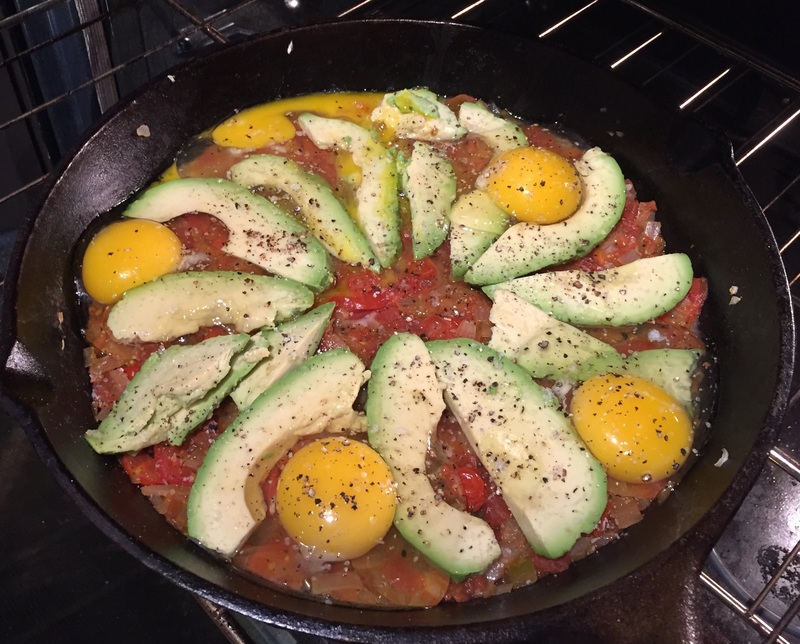 Heat cast iron skillet with a tablespoon of olive oil. Saute onion until translucent. Add tomatoes and saute until juices have evaporated, approximately 10 minutes. 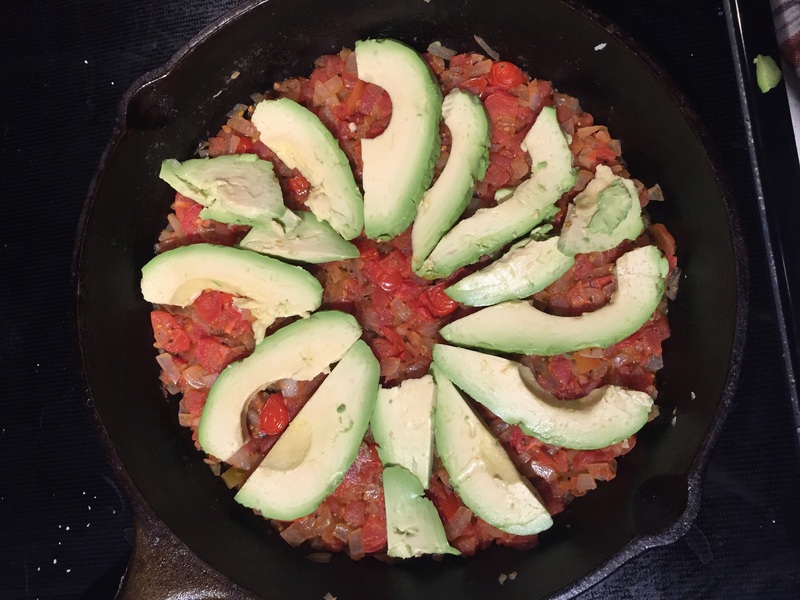 Slice avocado and place on top of tomatoes. Bake 10-12 minutes, or until eggs are to your yolk liking.